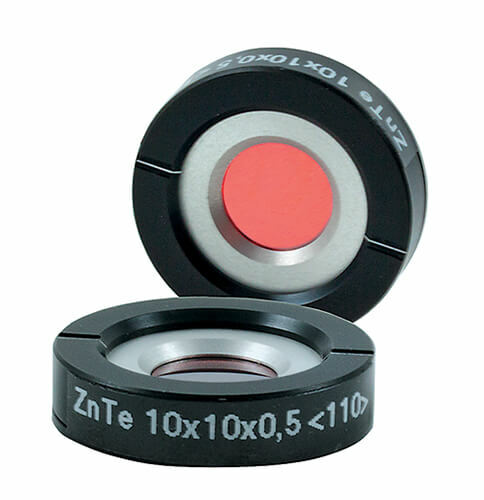 Semiconductor THz Crystals: ZnTe (Zinc Telluride) crystals with <110> orientation are used for THz generation by optical rectification process. Optical rectification is a difference frequency generation in media with large second order susceptibility. For femtosecond laser pulses which have large bandwidth the frequency components interact with each other and their difference produce bandwidth from 0 to several THz. Detection of the THz pulse occurs via free-space electro-optic detection in another <110> oriented ZnTe crystal. The THz pulse and the visible pulse are propagated collinearly through the ZnTe crystal. The THz pulse induces a birefringence in ZnTe crystal which is read out by a linearly polarized visible pulse. When both the visible pulse and the THz pulse are in the crystal at the same time, the visible polarization will be rotated by the THz pulse. Using a λ/4 waveplate and a beamsplitting polarizer together with a set of balanced photodiodes, it is possible to map THz pulse amplitude by monitoring the visible pulse polarization rotation after the ZnTe crystal at a variety of delay times with respect to the THz pulse. The ability to read out the full electric field, both amplitude and delay, is one of the attractive features of time-domain THz spectroscopy. 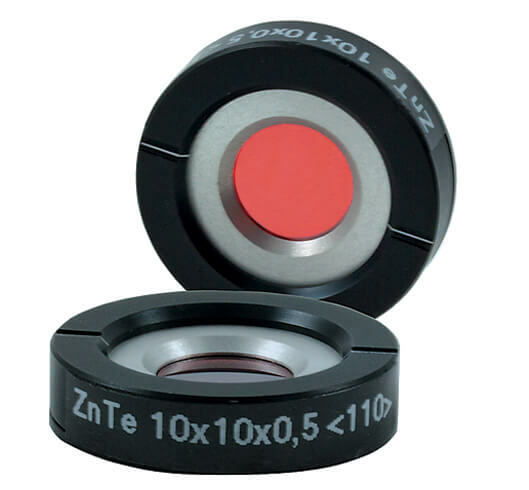 ZnTe are also used for IR optical components substrates and vacuum deposition. NOTE: ZnTe crystal contains micro bubbles and they are visible in projection of illuminated crystal. However this does not affect the THz generation. We do not accept complains on presence of bubbles in crystal. GaSe (Gallium Selenide) crystals used for THz generation shows a large bandwidth of up to 41 THz. GaSe is a negative uniaxial layered semiconductor with a hexagonal structure of 62 m point group and a direct bandgap of 2,2 eV at 300 K. GaSe crystal features high damage threshold, large nonlinear optical coefficient (54 pm/V), suitable transparent range, and low absorption coefficient, which make it an alternative solution for broadband mid infrared electromagnetic waves generation. Due to broadband THz generation and detection using a sub-20 fs laser source, GaSe emitter-detector system performance is considered to achieve comparable or even better results than using thin ZnTe crystals. In order to achieve frequency selective THz wave generation and detection system, GaSe crystals of appropriate thickness should be used. NOTE: because of material structure it is possible to cleave GaSe crystal along (001) plane only. Another disadvantage is softness and fragility of GaSe.